One last look at the small pictograph site around the corner from our campsite on the point and we were off at 7:15. 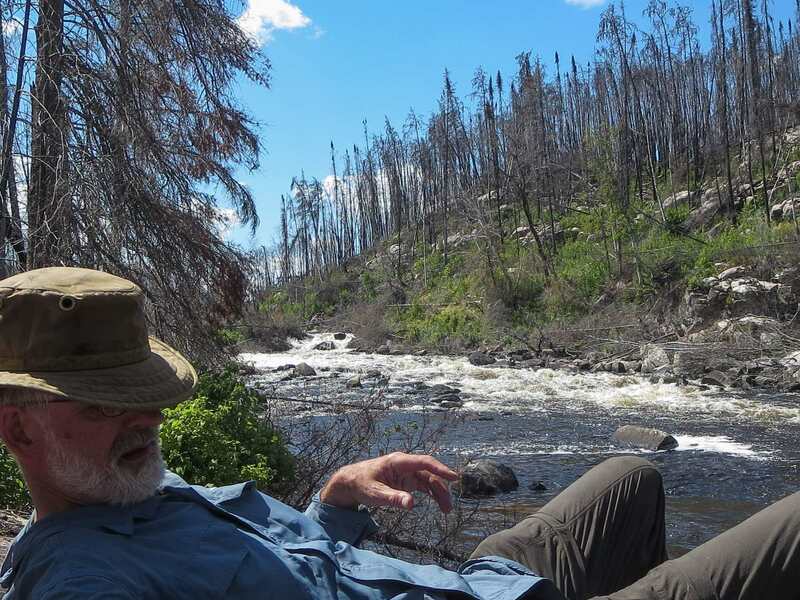 The goal for the day was to paddle through Larus and find a campsite a few kilometres further downriver. The highlight promised to be the pictograph site on a narrow stretch of the river as it flows from Murdock to Larus. And while there was a portage this day, we knew that the worst of the hauling was done. Images expand with a click or two; blue text leads to more info with a click. This day was one of those when we just broke camp and did some paddling before having breakfast. 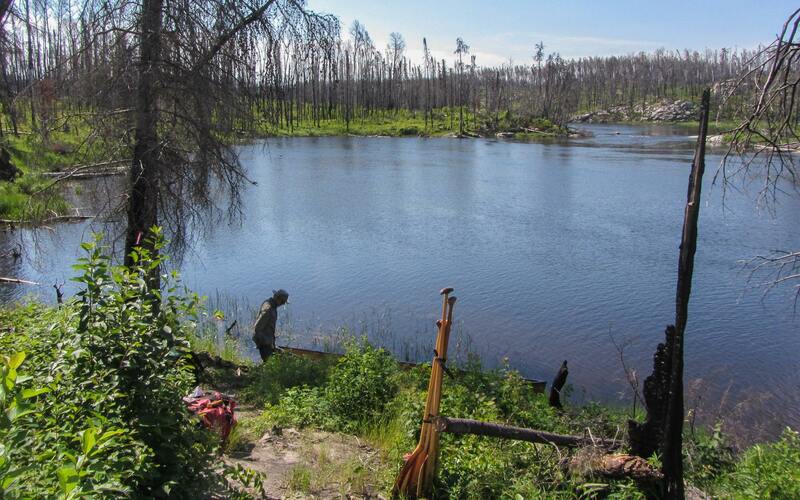 We covered a bit over ten kilometres to the north end of Murdock Lake, looking for a nice spot to pull over. 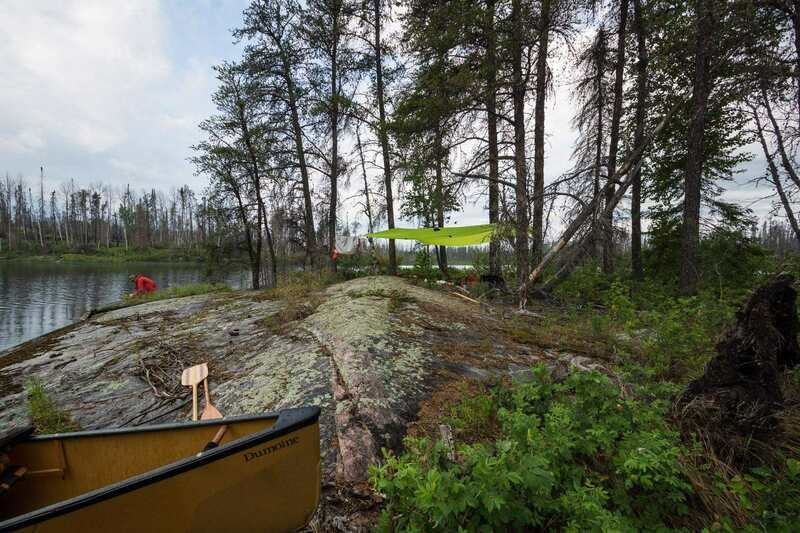 The flat rock and potential campsite on the shores of a small island we were approaching were just what we needed as we heard the sound of thunder in the distance. We soon had the tarp up and the food bag out. We used the butane stove to boil a liter of water, enough for the usual oatmeal and the mugs of filtered coffee. In the hour that we were there the storm blew over and when we left it was sunny and a bit windier than it had been. The beautiful light that bathed the lake after the mini-storm gave me every reason to haul out the dslr and frame a few shots of the scene. 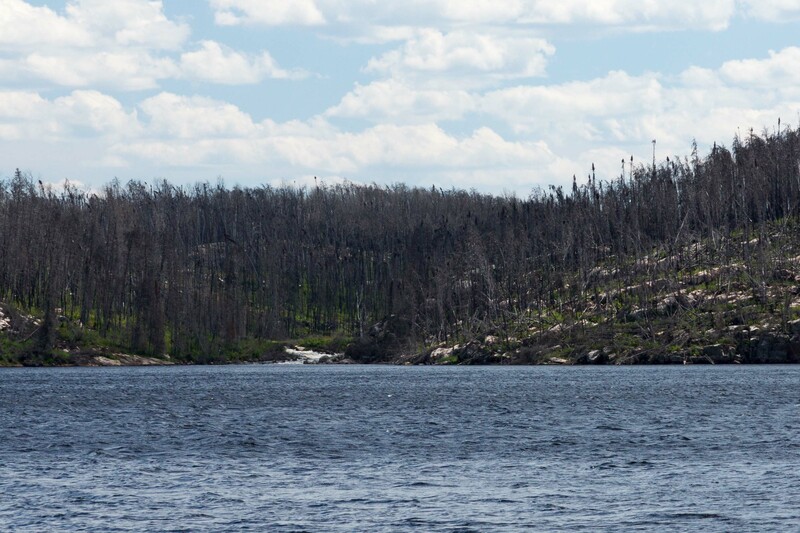 We then paddled along a stark shoreline lined with blackened tree trunks which had seen a major fire three years ago. 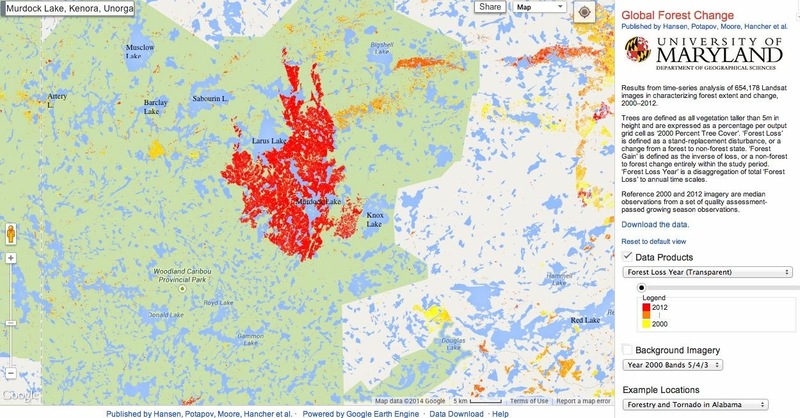 What we saw was the result of 2011’s massive Red Lake Fire #124 in the Murdock/Larus area illustrated by the map below. 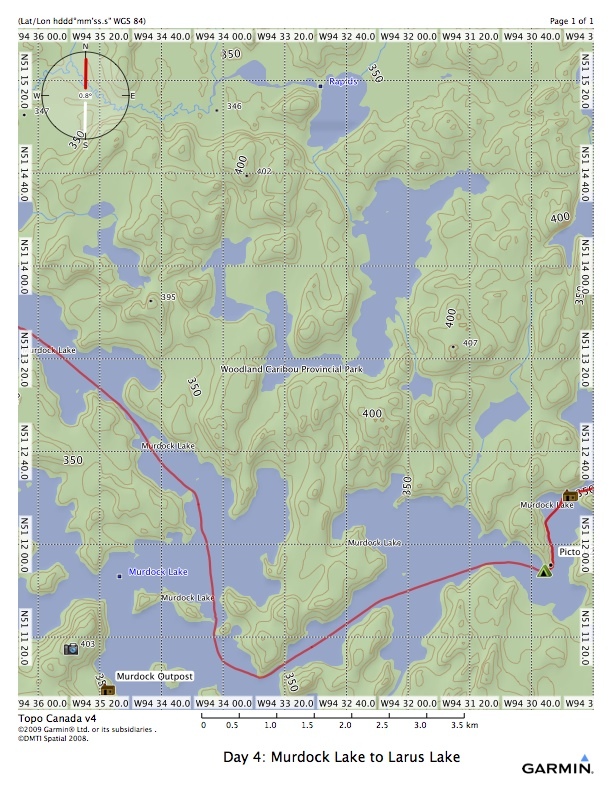 Another map which illustrates the extent of Red Lake #124 can be accessed here. Already the new growth blankets the area and you can see that a new cycle has begun. At the very top of the lake we headed west and ten minutes later we were face to face with one of the more dramatic single pictograph sites we had ever seen. 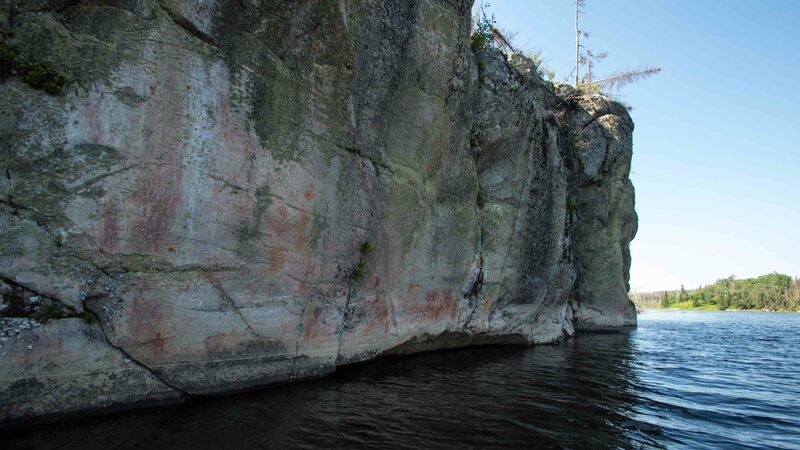 Here are a couple of the pix we took during the time we spent scanning the vertical granite rock face for any ochre-coloured images put on the rock by Anishinaabe medicine men and still discernible after 150 or more years of exposure to the elements. 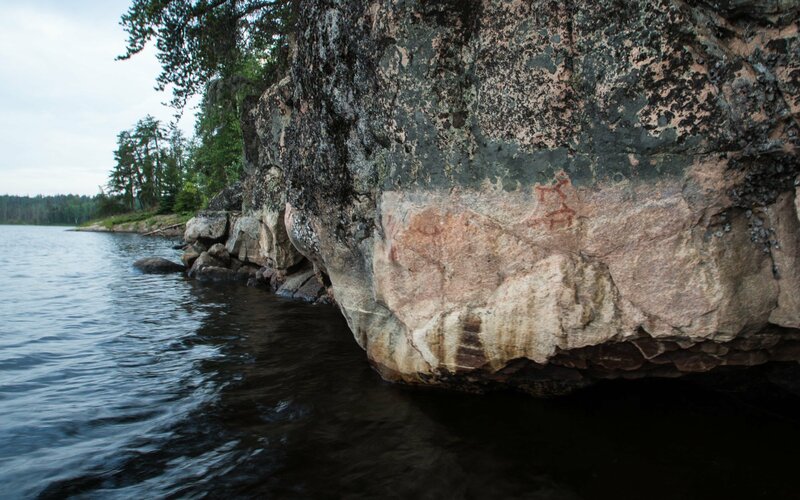 If you’re interested, I’ve put together about twenty images in the sequence you would see the various pictographs if you were paddling down the river. I have also included some related material (text and drawings) by Selwyn Dewdney. 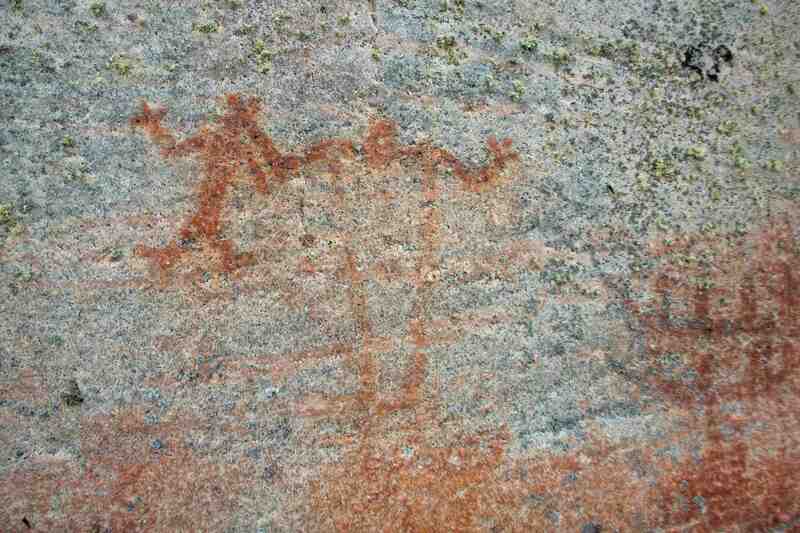 Click on the title – Anishinaabe Pictographs On The Bloodvein: the Murdock – Larus Site – to see the post. After our time with the pictographs we continued on. The pics above shows the take-out of the one portage of the day, an 850-meter carry which would take us around three sets of rapids. The photo also shows me standing next to our empty 42-lb. Swift Dumoine. 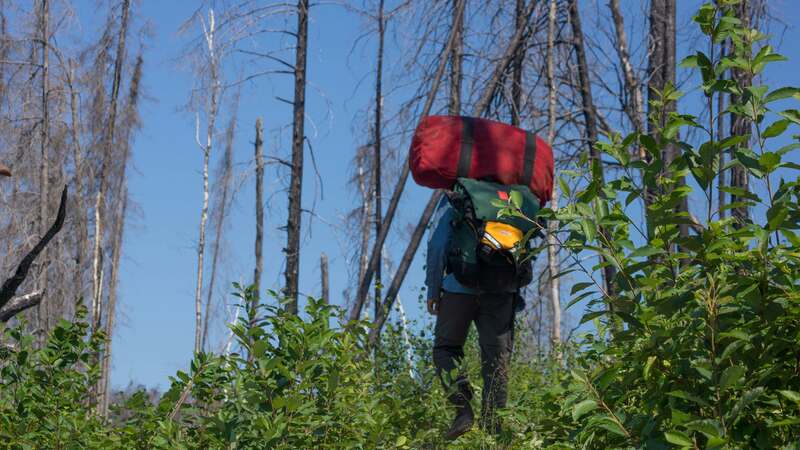 I would leave it there while I did my first carry – one of the Hooligan packs, a duffel and the paddles – half way across the portage. Our Dumoine on the loose! 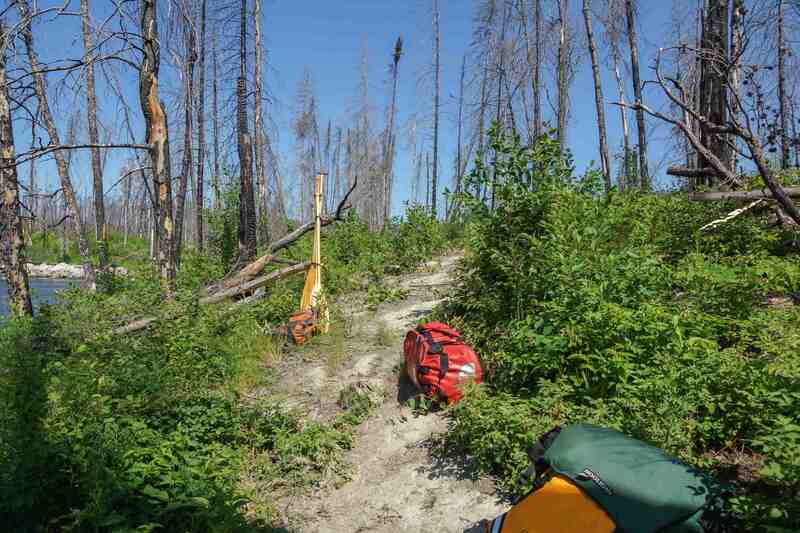 Unfortunately, deadfall across the trail meant a need to get out the Sven saw and do some trail maintenance. It was a while before I got back to the canoe. 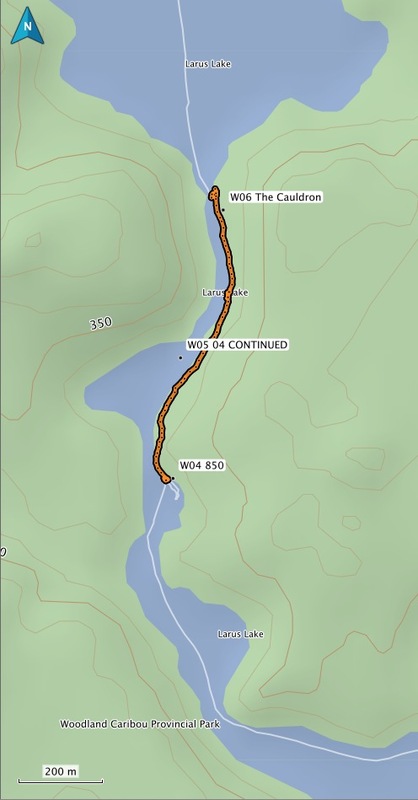 The Garmin in my pocket graphically captured the WTF moment when I returned to get the canoe! It had floated up river about thirty meters and I waded out to fetch it, feeling pretty stupid – and very lucky – at the same time. The portage done by one, we had a leisurely lunch at the put-in point below the Class IV rapids nicknamed “The Cauldron” in Wilson’s book. 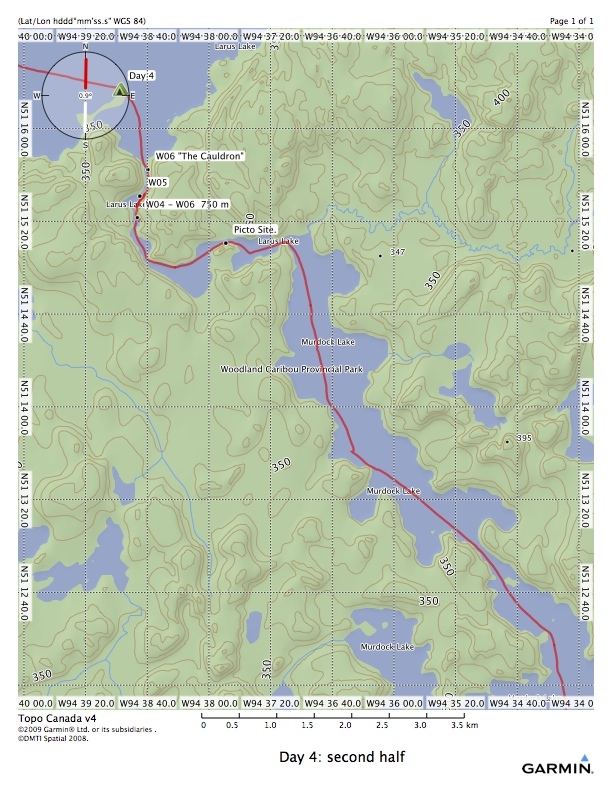 The 1:50000 topo has a water level of 339 for Murdock Lake; at the bottom of W06 and the start of Larus Lake it is 331 meters. 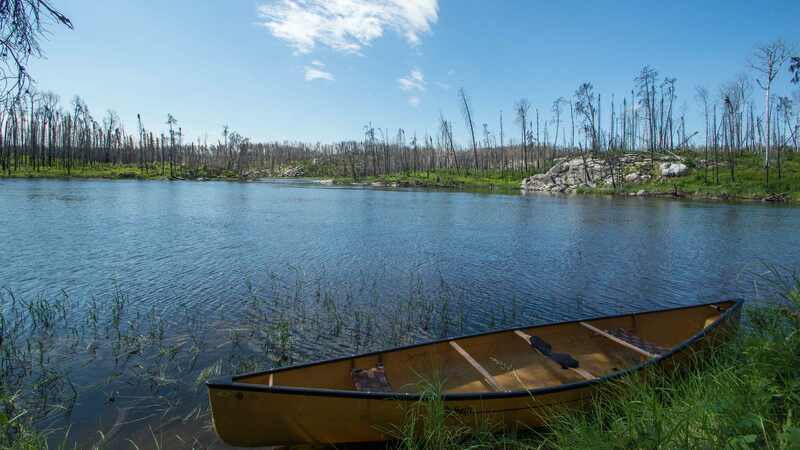 An eight-meter (26 feet) drop in less than a kilometre of river will definitely remind you that you’re paddling a river and not just a series of interconnected lakes, which I’ll admit is my overriding impression of canoeing in Woodland Caribou Park. 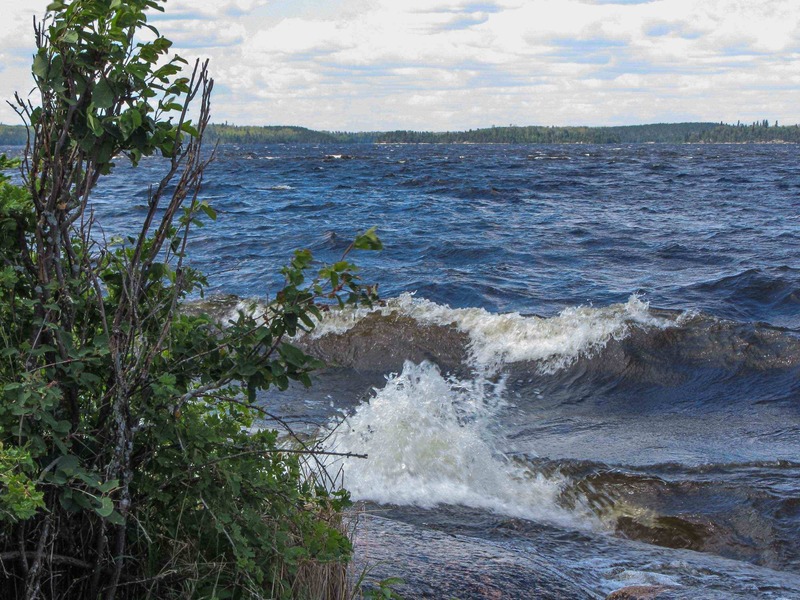 Indulging in a noontime cup of filtered coffee, we noted that the west wind had continued to pick up; noticeable on Larus were whitecaps as the waves came rolling in to the east shore. 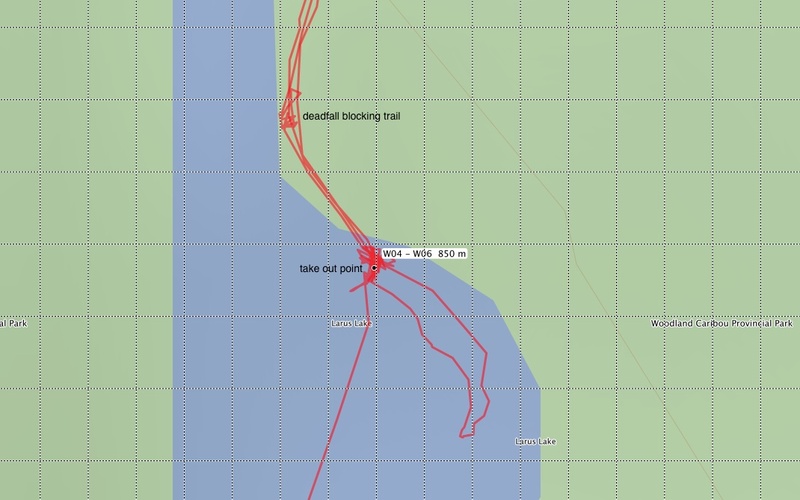 Lunch done, we set off – as the day’s maps show, we really didn’t get very far before deciding that doing a four-kilometer crossing of Larus to the west end could wait until the next day. 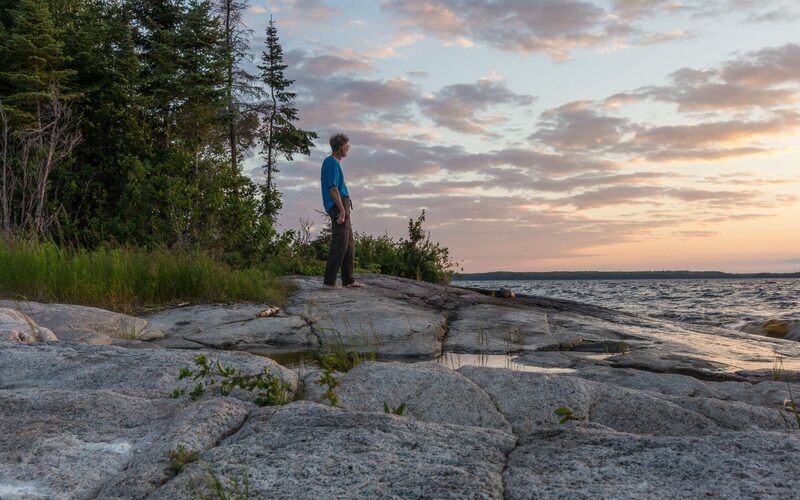 We ended up at a campsite – in a sheltered bay on the tip of the spit just a kilometer from our lunch spot – that Wilson had recommended if the wind on Larus was of concern. Tent up and canoe put into use as a wind screen, we rambled around the spit. A bit of bushwhacking and we were on the east side of the spit with a view of where we had lunch a couple of hours ago. 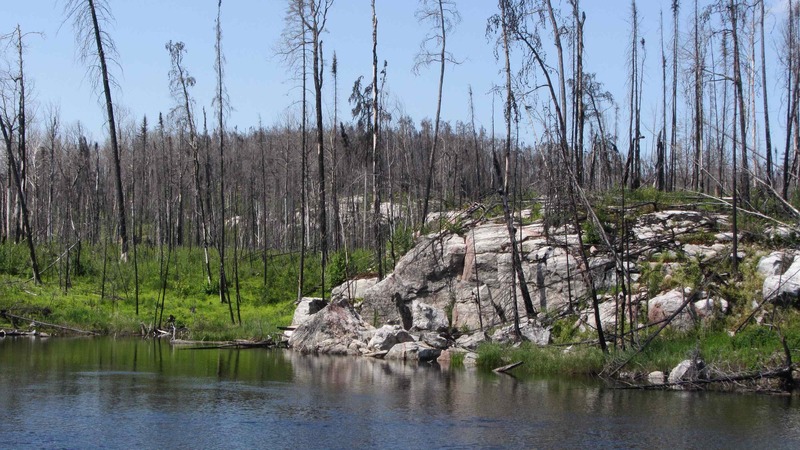 Looking back was also a last reminder of Fire 124’s impact on the area we had just paddled through. 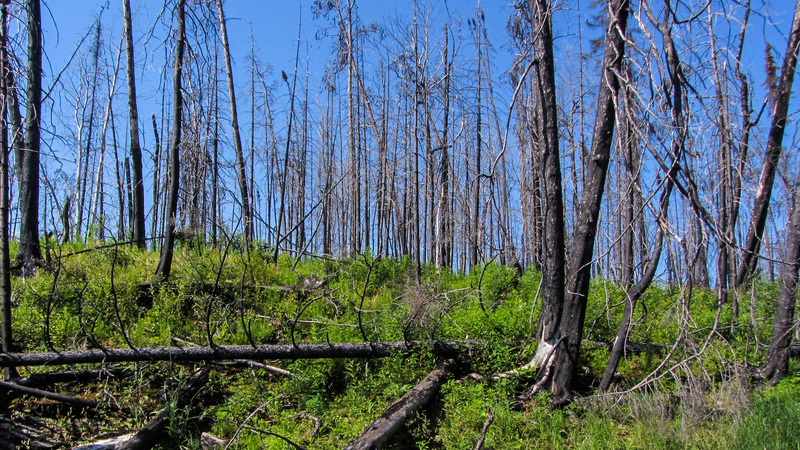 As the fire map above makes clear, while we would be seeing some more evidence of fire, Day 4 presented us with the worst of it. 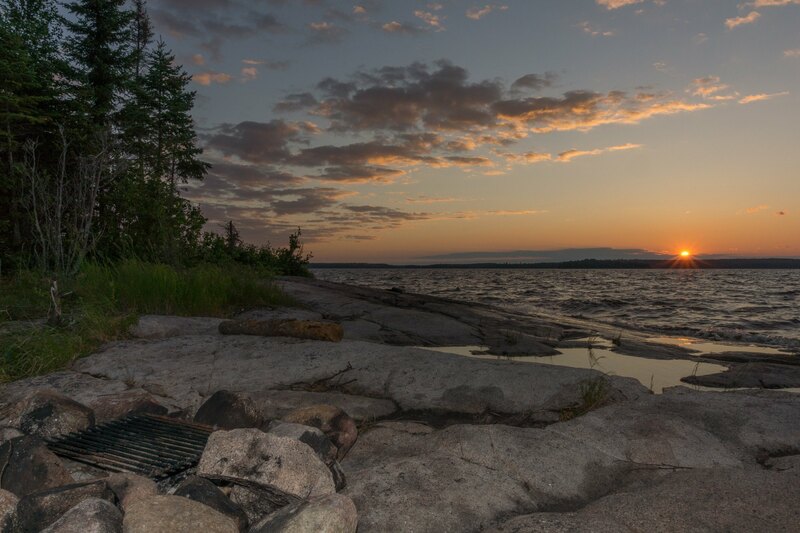 Our evening on the spit on the east end of Larus Lake ended with our first bear sighting of the trip. It was a bit after dusk when we heard a racket in the mess of deadfall down the spit a bit. 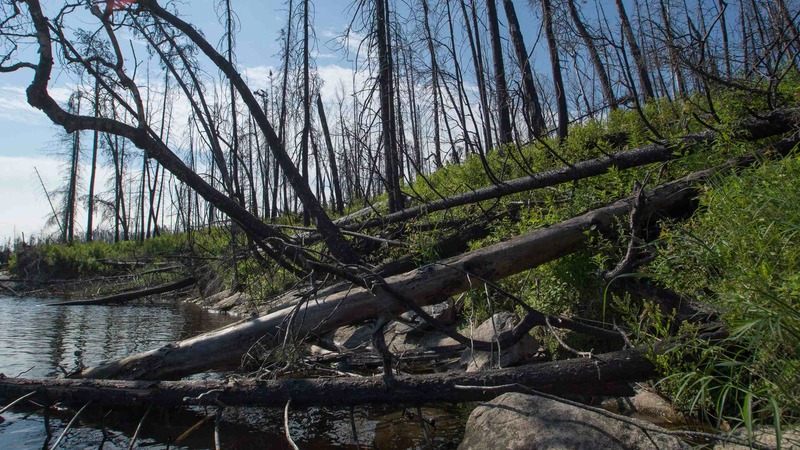 I popped out of the tent to see a bear cub – but no mama – about twenty-five meters away. A few shouts and hand claps and it was gone – hopefully scared after her first human encounter; to reinforce it, I fired off a Bear banger. We’ll admit to sleeping with ears wide awake that night – but also on our minds was the west wind. We hoped to get across Larus the next day nice and early. 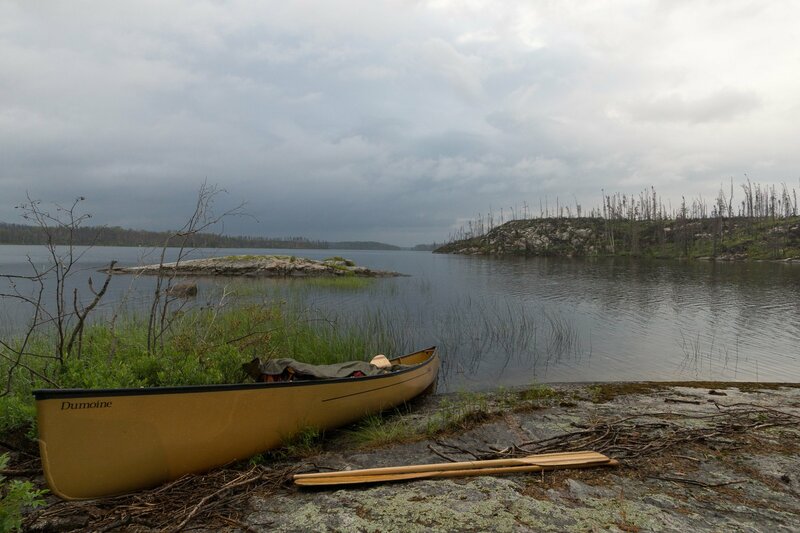 This entry was posted in Pictographs of the Canadian Shield, wilderness canoe tripping and tagged bloodvein river canoe trip. Bookmark the permalink. Biff, nice to hear you’re enjoying the posts. And if they’re are stirring in you that feeling that you need to get out there too – that’s even better! 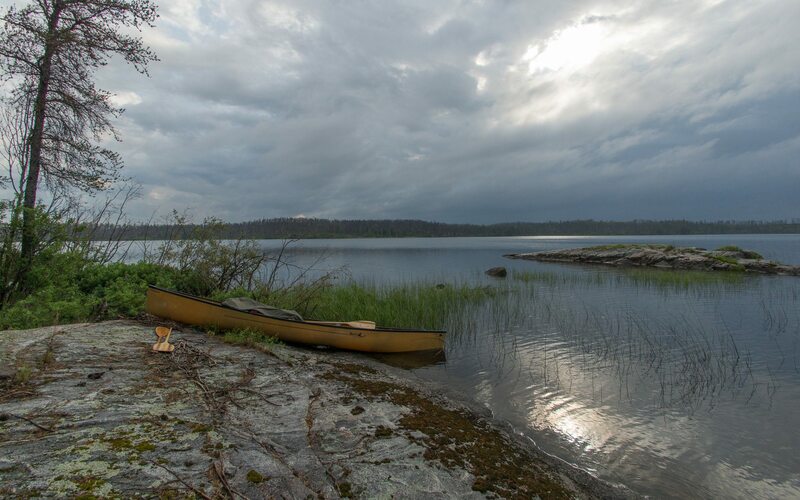 A life without plans of an upcoming canoe trip is not a life worth……………… well, maybe a bit overly dramatic, but you get the point! Hi, Thanks for your thorough site. Did you find the Cauldron too rough to paddle? Darryl, the Cauldron was part of the three-rapids-in-one portage (W04-W05-W06) that we did that day. Of the three it was by far the snarliest. Given that we travel alone in a Kevlar carbon boat, we tend to be conservative in our choice of rapids to run. W06 didn’t qualify! Wilson writes that The Cauldron is not runnable and gives it a CIV – a couple of notches above anything we would try. You may, however, be able to halve the 725 meters of portaging we did by running W04, which Wilson rates a CII. 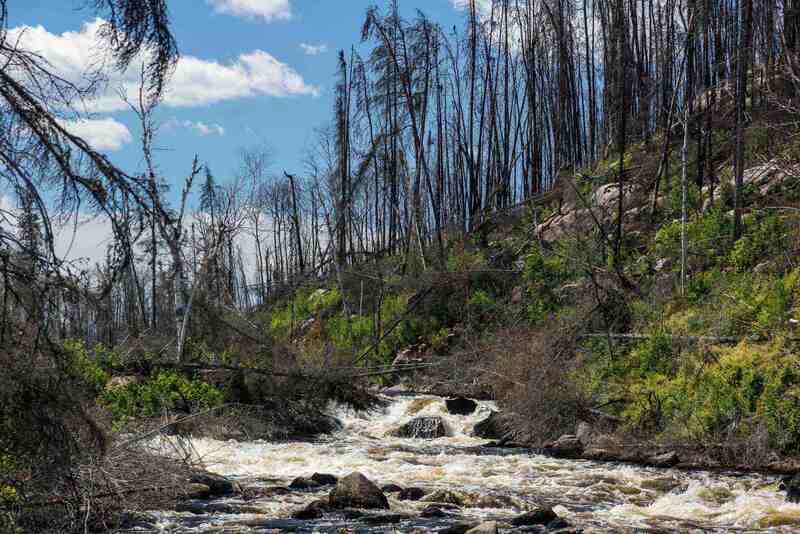 Take a good look before you slip into the stream. BTW I checked out your website for more info on that “rowing to Cuba” reference! I figured you might have had a Pierre Trudeau moment and started paddling for Havana from Key West, in which case any advice on The Cauldron would seem superfluous!